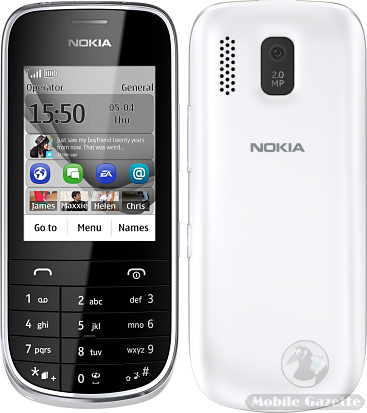 Nokia's "Asha" range of handsets are low cost but versatile feature phones, aimed at those who don't want or cannot afford an expensive smartphone. The Nokia Asha 202 and Nokia Asha 203 are two of the simpler devices in this range, retailing for just €60 excluding tax and subsidy. 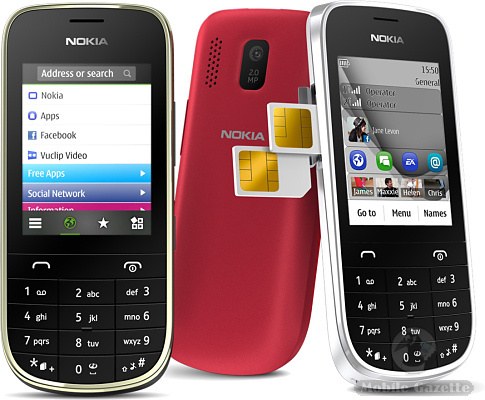 Both handsets are very similar, the Asha 202 is a dual-SIM handset and the Asha 203 is a traditional single-SIM device. The Asha 202 has an easy-swap SIM slot in the side plus a SIM manager and a slightly different keyboard, and the single-SIM 203 comes in two dual-band GSM variants compared to one for the 202 ,otherwise these two Asha phones are the same. It looks like a normal "candy bar" phone, but the 2.4" QVGA display is actually a basic touchscreen panel, making this one of Nokia's "Touch and Type" range. Although this does not offer the sophistication of a high-end device, these simple resistive panels are quite useful. On the back is a basic 2 megapixel camera, the Asha 202 and 203 support Bluetooth, come with a microSD slot, have a media player, USB connectivity and an FM radio and also a 3.5mm audio socket. This is a GSM-only device with GPRS and EDGE data support only, rather than 3G. Overall the specifications are not bad for this sort of price, in our opinion. This is a Series 40 device, so your choice of applications is a bit more limited. However, it does come with Facebook and Twitter support, a web browser optimised for the relatively slow data connection, some personal information management tools and it comes with 40 EA games that can be downloaded from the Nokia Store. Inside is a relatively large 1020 mAh battery that can power both phones for up to 5 hours talktime and 16 days standby time in the case of the dual-SIM 202, with 27 days standby time for the single-SIM 203. Both handsets measure 115 x 50 x 14mm and weigh 90 grams. The Asha 202 will be available in black, sliver white, golden white, red and grey colours and the 203 in silver white, red and grey only. Presumably some markets will have the Asha 203 and some the Asha 202 although specialist retailers might be able to help you get the dual-SIM version if you only have the 203 in your country. Nokia say that both handsets should be available from Q2 2012.